There are fires burning somewhere on the planet every day—nearly one million per year—and satellites help detect them even when no one is talking about them. 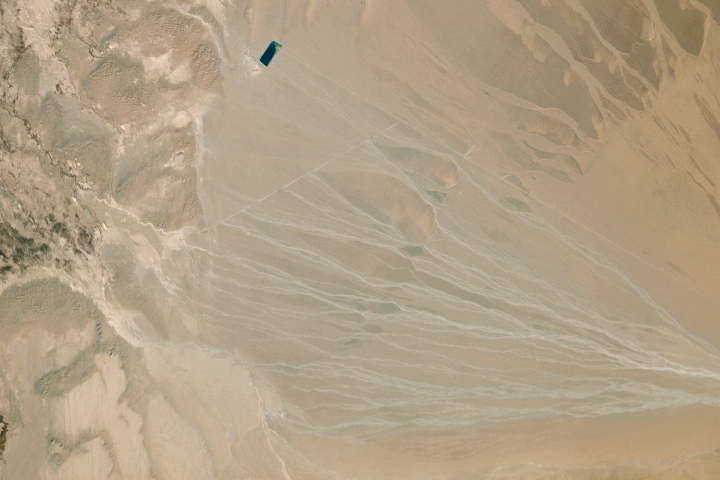 The Moderate Resolution Imaging Spectroradiometer (MODIS) instruments on NASA’s Aqua and Terra satellites acquired this series of images between September 15 and October 18, 2018. 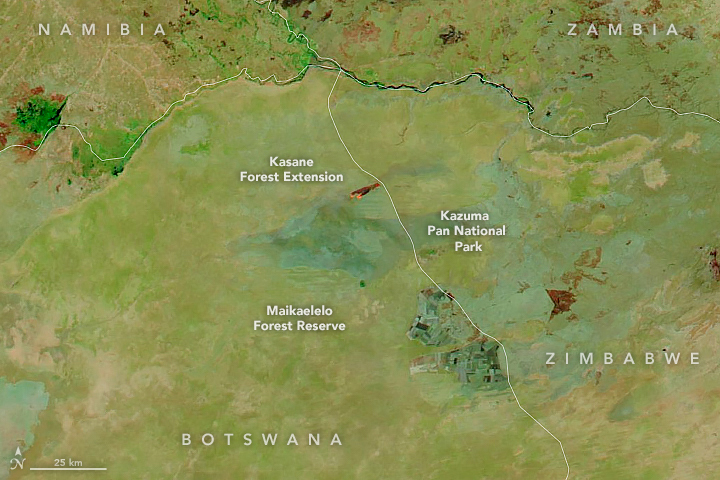 The fires burned along the border between Botswana and Zimbabwe, in and around Kasane Forest Reserve, Maikaelelo Forest Reserve, and Kazuma Pan National Park. 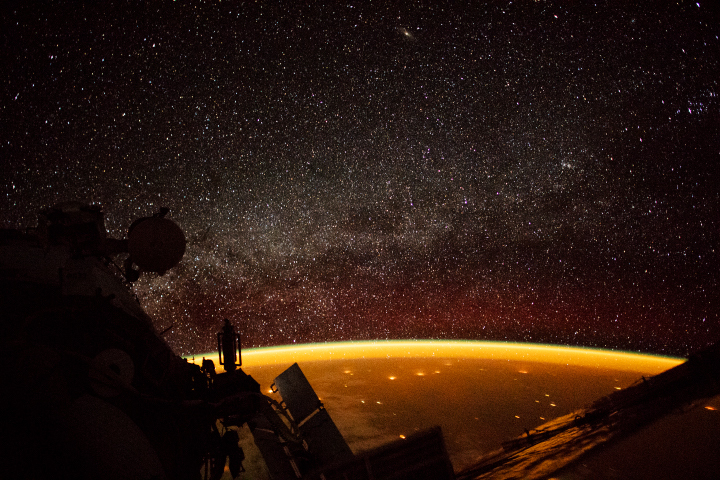 The images were composed from a combination of visible and shortwave infrared light (MODIS bands 7-2-1). The burn scar appears in shades of orange and dark brown; vegetation is green; bare ground is light brown; and water is dark blue. “Most, if not all, fires in Africa are man-made in one of its various forms: prescribed, agricultural, accidental, or arson,” said climate and fire researcher Charles Ichoku of Howard University. “It is still the fire season in that part of southern Africa, but the behavior of the fires seems curious.” The veldt (grassland) fire season in this part of Botswana typically runs from May to November. The exact causes of the fires are not clear, and some of the straight fire lines make it appear that these were managed burns. But those distinct lines more likely indicate fire breaks. 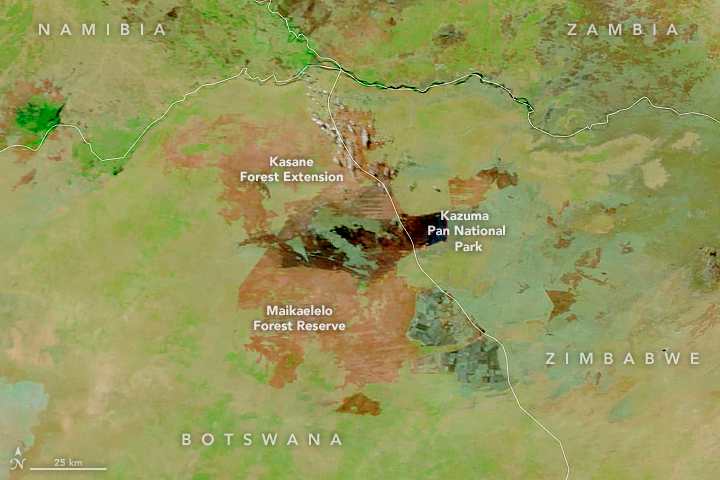 Anja Hoffmann, a researcher with the Global Observation of Forest and Land Cover Dynamics project, noted that Botswana is covered with a network of fire breaks stretching 10,000 kilometers and with an average width of 20 to 30 meters. In the 21st Century, satellites have become important for monitoring fires on a local, regional, and global scale. They play a role in helping firefighting agencies control some blazes and in managing the protection of life and resources. On longer time scales, satellite detections help scientists better understand the way fires evolve and spread, what they emit into the atmosphere, and how they respond to changing climate conditions. With 19 years of MODIS fire detections in the NASA archives, researchers are building databases and models to better understand fire behavior on regional and global scales. One such effort is the Global Fire Atlas, a web-based dataset that estimates the size, duration, spread rate, and direction of every large fire detected in the MODIS burned area data. NASA Earth Observatory images by Lauren Dauphin, using MODIS data from NASA EOSDIS/LANCE and GIBS/Worldview. Story by Michael Carlowicz. Satellites detect fires that are not necessarily being reported. Scientists are taking note and compiling global views of fire behavior and evolution. Andela, N. et al. (2018) The Global Fire Atlas of individual fire size, duration, speed, and direction. Earth System Science Data Discussion , in review. Dube, O. (2013) Challenges of wildland fire management in Botswana: Towards a community inclusive fire management approach. Weather and Climate Extremes , 1, 26–41. Global Fire Emissions Database (2018, August 9) Global Fire Atlas. Accessed October 18, 2018. Mmegi Online (2008, October 16) Ripple effect of veldt fires on Botswana. Accessed October 18, 2018. 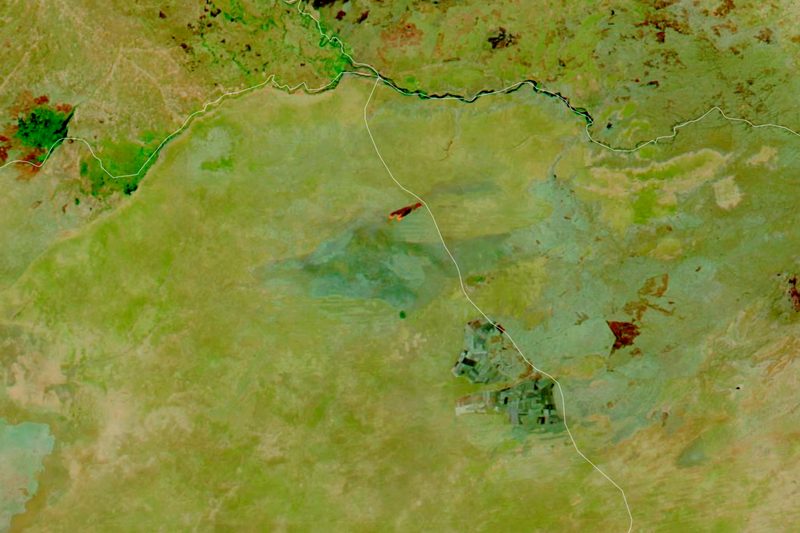 NASA Earth Observatory (2018, May 30) Fire Marches Across the Okavango Delta. NASA Earth Observatory (2016, August 9) Going High-Tech for Fire Detection. SBS News (2017, November 16) Indigenous fire use spreads to Botswana. Accessed October 18, 2018.